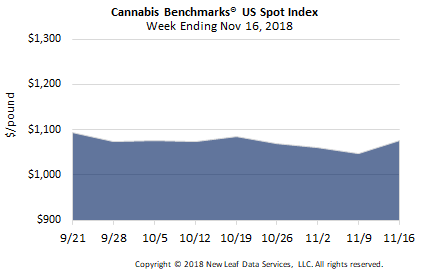 U.S. Cannabis Spot Index up 2.7% to $1,076 per pound. The simple average (non-volume weighted) price increased by $16 to $1,262 per pound, with 68% of transactions (one standard deviation) in the $485 to $2,040 per pound range. The average deal size increased 3.8% to 4.2 pounds. In grams, the Spot price was $2.37, and the simple average price was $2.78. National Transaction Stats continued to display steadiness this week. Just like last week, the relative volume of each grow type traded was stable compared to the week prior. 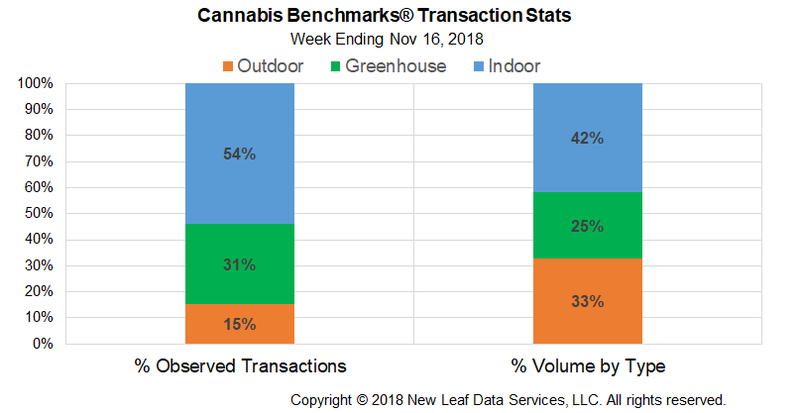 The relative frequency of transactions for indoor-grown flower decreased slightly week-over-week, by 1%, with deals for greenhouse product seeing a rise of the same proportion in this metric. The relative frequency of trades for outdoor flower was flat compared to last week. The U.S. Spot Index rose by 2.7% this week to settle at $1,076 per pound, breaking a streak of three consecutive weeks of declines. 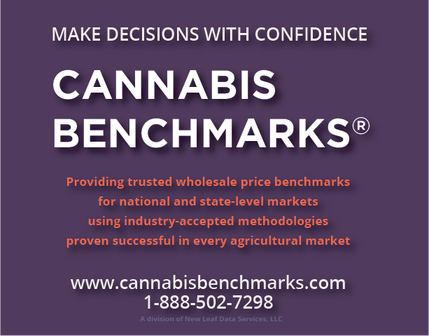 The national volume-weighted prices for all three grow types were on the upswing this week, as were the Spot Indices of three of the four major Western markets, with Washington State the only exception. Wholesale prices may have been pushed upward by increased demand ahead of the Thanksgiving holiday, as the subsequent weekend has become one where retailers expect increased sales. Last year at this time, though, the U.S. Spot fell to its annual low of $1,368 per pound in the week ending November 17, 2017. However, it would rise the following week, to $1,392 per pound. Data from prior years suggests that this year’s annual low may already be behind us, but very different market landscapes in 2018 mean that unprecedented price movements remain well within the realm of possibility. 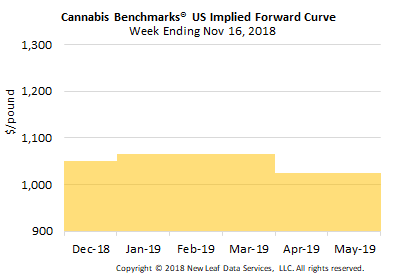 Average deal sizes were up across the board this week, although the growth in the mean volume of transactions involving outdoor flower slowed compared to observations from recent weeks. Retailers and medical dispensaries may be looking to bring in inventory ahead of next week’s Thanksgiving holiday, when most will offer discounts and promotions in an attempt to drive increased sales. 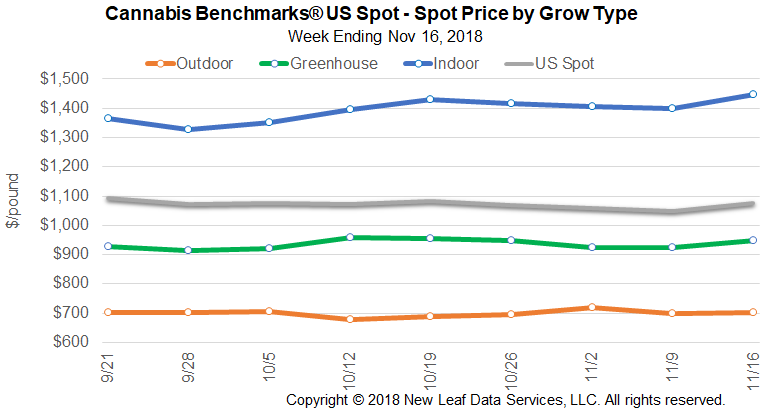 Average deal sizes were also on the upswing for the most part at this time last year, with the only exception being that for greenhouse product. December 2018 Forward unchanged at $1,050 per pound. The average reported forward deal was unchanged at 56 pounds. The proportion of forward deals for outdoor, greenhouse, and indoor-grown flower were also unchanged, representing 56%, 29%, and 15% of forward arrangements, respectively. The average forward deal size for monthly delivery for outdoor, greenhouse, and indoor-grown flower was 69 pounds, 38 pounds, and 41 pounds, respectively. At $1,050 per pound, the December Forward represents a discount of 2.4% relative to the current U.S. Spot Price of $1,076 per pound. The premium or discount for each Forward price, relative to the U.S. Spot Index, is illustrated in the table below.